Like the previous two steps to debt freedom, I heard about the Debt Snowball Plan through Dave Ramsey's blog. I thought it was genius, so I told Matt about it a few weeks ago. He'd been kind of unexcited about budgeting and pretty hesitant to ditch credit cards and use cash for everything, but once he heard about this, he changed his tune. He plugged our debt numbers into a spreadsheet, did some calculations, and got all fired up. And when he shared his calculations with me...I saw the world in a completely different light. He found that, using this method, we could be completely debt free in about four years. No credit card debt, no student loans, no car payments. Nothing. See, my student loans are something I had decided would always be there. The thorn in my side I would have to accept and learn to live with. Because after making minimum payments on time, year after year, I somehow owe more now than I did when I started. Man, that irked me. I grew so angry and so bitter about it, that at some point, I forced myself to stop getting all worked up over it and just accept the fact that I would be paying a couple hundred bucks to Sallie Mae every month for the rest of my life. But nope. Not with the Debt Snowball Plan. If we stay fired up and follow it carefully, we can completely unshackle Sallie Mae from our ankles! We are so ready to get our snowball rollin'. Neither of us have ever tried anything like this before, and we can't wait to see how it works. Let's go over the deets, shall we? This will likely be one of the toughest part of the process. But as hard as it is to face the numbers, you have to do it if you want to things to improve. 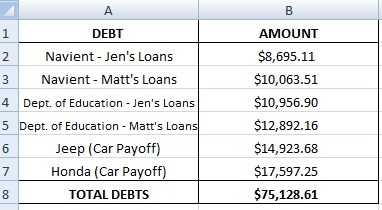 You'll need to arrange them from smallest balance to the highest balance, as I've done here by placing my $8,695.11 Navient balance first and my largest debt, the Honda balance of $17,597.25 at the bottom. This is why you need to arrange them in order of smallest to greatest. Though you might think it'd make more sense to pay off the balance with the highest interest rates first, Ramsey says to start with the smallest loan. 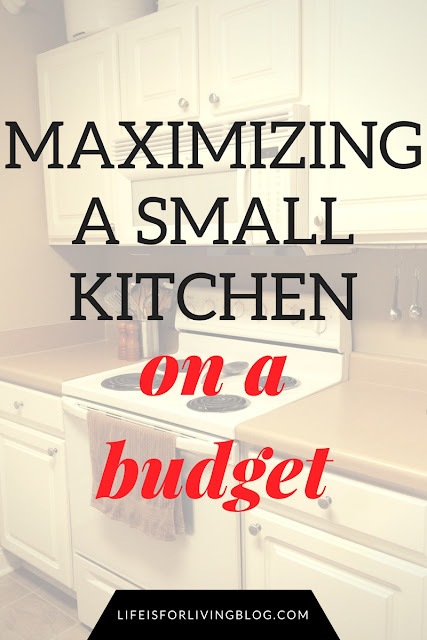 The smaller the debt, the faster you'll pay it off. And once you pay off that first debt, you'll see the results of your efforts, feel the excitement, and work that much harder to gain momentum. To make any major progress here, in addition to cutting off credit card use to keep from adding to your debt, you'll need to pay more than the minimum payment. 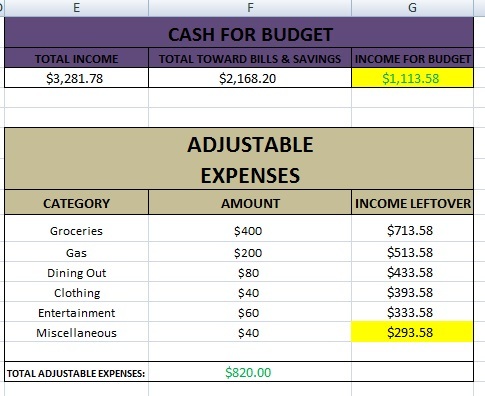 In this example, after paying our fixed expenses, we have $1,113.58 to divide up on our adjustable expenses to get through the month. After we take out money for our groceries, gas, dining out, clothing, entertainment, and miscellaneous cash envelopes, we will have $293.58 remaining in our bank account that needs to go somewhere. And guess where that somewhere would be? Yep. The smallest debt. So, if the minimum payment coming out of our fixed expenses for this debt is $78.14, when we add our leftover $293.58 to it, it increases our monthly payment to $371.72. That's almost five times more than what we've been paying each month, which means we'll pay off that loan five times faster than we would have before. Oh yeah. That'll add up quickly. This is the part that got us all excited. Let's say that after paying $371.72 every month for a while, that smallest debt, my Navient loan is paid off (Woohoo!). We can readjust our list. 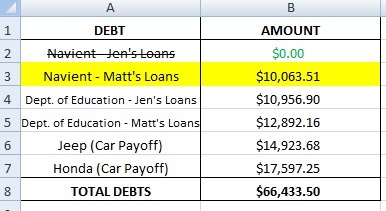 We can now move on to the next largest debt, Matt's Navient loan. According to our fixed expenses budget, we pay $82.13 toward this loan each month. 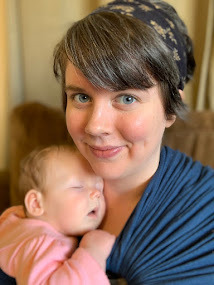 But since we don't have to worry about my Navient loan anymore, we can throw all that extra money we'd been putting toward it onto Matt's Navient loan now! That means $82.13 + $371.72, which equals $453.35. Then when this loan is paid off, we take that $453.35 and move to Matt's Dept. 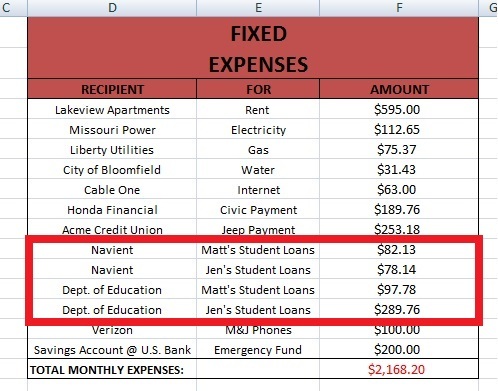 of Education loan, which is $97.78 each month. 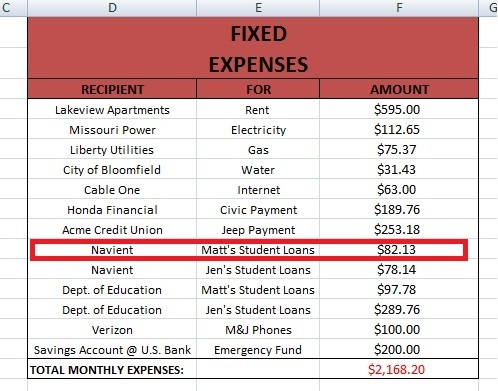 Those added together equal $551.13 put toward one loan. I know it sounds complicated, but it's really quite simple. 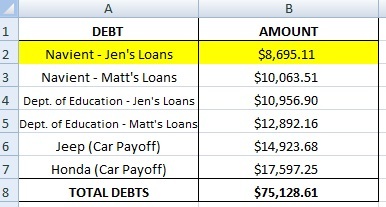 You're just compounding your payments ("building a snowball") as you pay off debts until finally, you end up making $1,300 monthly payments on your biggest debt. And at that point, it's no time until you're DEBT FREE! Gosh, can you imagine? No student loan payments. No credit card payments. No car payments. That would knock out more than half of our fixed expenses. Without those bills, we'd ultimately have $1,300 each month that we wouldn't know what to do with. That's how Ramsey uses these methods to build wealth. Once you're debt free, you start putting that extra $1,300 into savings and investments each month. In a year, that's $15,600. In ten years, that's $156,000. When you're old and ready to retire, you're set. Your kids have money for college. You have enough money to give freely to people in need. You're livin' the good life. Whoooo, it gets me excited! We're just now starting to chip away at our smallest debt, one of our credit cards. It's pretty cool- it does add up quickly when you're not adding to your balance by swiping the plastic. It's gotta be incredible to watch this method get rolling and take off. We can't wait to see how it goes! Have any of you tried this? 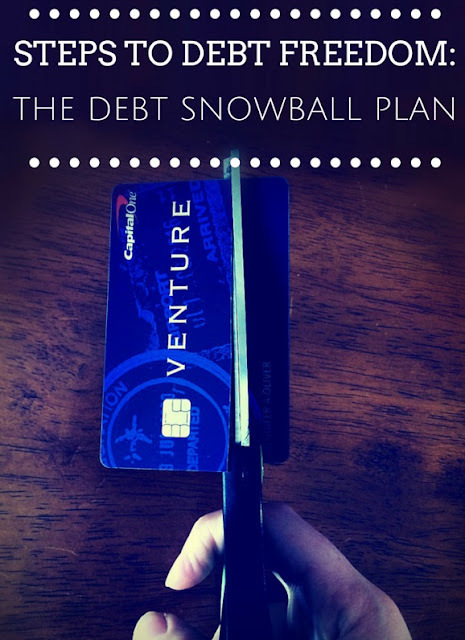 What are your thoughts on the Debt Snowball? So rad! My mom is doing this with medical bills they have to pay off and it's working. I think the key is to be consistent and try to never go back to only paying the minimum on whichever one you are working on. You guys can totally make this happen in four years! You got this!